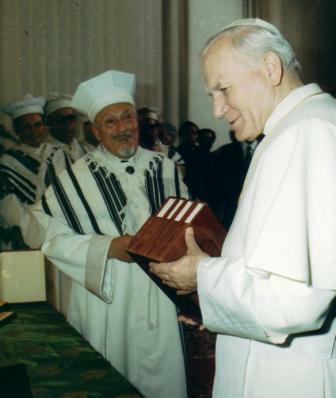 Beginning with the Second Vatican Council (1962-1965), relations between the Catholic and Jewish communities have developed in new and positive ways that are unprecedented in the previous two thousand years. Founded in 1967, in the immediate aftermath of the Council, the Institute for Jewish-Catholic Relations of Saint Joseph's University has been a participant in this unfolding interfaith rapprochement. 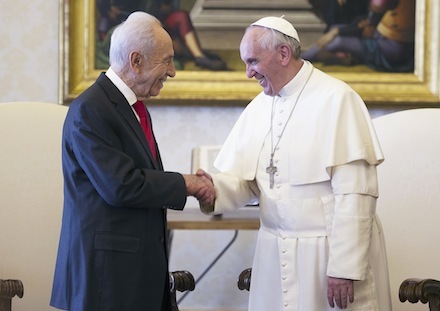 Pope Francis greets Israeli President Shimon Peres at the Vatican, April 30,2013. Flowing from the Catholic and Ignatian identity of Saint Joseph's University, the Institute's mission is to increase knowledge and deepen understanding between the Jewish and Catholic communities. In keeping with the contemporary Ignatian vision of educating "men and women for others," the Institute is guided by the University's commitment to: Spirit–Intellect–Purpose. It pursues a vision of shalom (or "right relationship") between Catholics and Jews in partnership with scholars and religious leaders around the nation and the world. The Institute for Jewish-Catholic Relations of Saint Joseph's University is a member of the Council of Centers on Jewish-Christian Relations (CCJR), an association of centers and institutes in the United States and Canada devoted to enhancing mutual understanding between Jews and Christians.